Growing tiger flower provides brightly colored, though short-lived, blooms in the summer garden. Also known as Mexican shell flowers, the species is botanically named Tigridia pavonia, as the center of the flower center resembles a tiger’s coat. Tigridia shell flowers in the garden appear in succession, for two to three weeks, offering a spectacular showing of the beautiful blooms. Thirty species of Tigridia shell flowers are found, mainly from Mexico and Guatemala, and are members of the Iridaceae family. 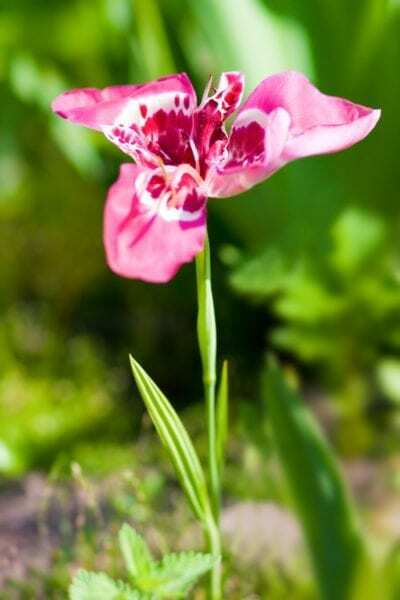 Tiger flowers resemble the gladiola, with 3 to 6 inch flowers in colors of pink, red, white, yellow, cream, orange or scarlet. Triangular shaped petals of solid colors adorn the outer edges of the flower with a center that has a tiger skin or seashell-like appearance. The pleated foliage has the appearance of a fan, adding to the beauty of the growing tiger flower. This foliage dies back in fall. Plant Tigridia shell flowers in the garden in spring. Tiger flowers are semi-hardy and can be damaged at temperatures of 28 F. (-2 C.) and below. Those in zones with cold winters should lift the bulbs and store them during winter. In warmer areas where bulbs are not lifted, tiger flower care includes division every few years. When planting Tigridia shell flowers in the garden, plant them 4 inches deep and 4 to 5 inches apart. You may also want to plant them in masses throughout the garden for a colorful summer show when they bloom. Plant tiger flowers where they’ll get hot afternoon sun. You can also grow tiger flower in containers, but they should be protected from winter rains. Tiger flower care is simple if you plant them in rich and well-draining soil and provide moisture regularly. Fertilize with a weak mixture of liquid fertilizer a few times prior to bloom. 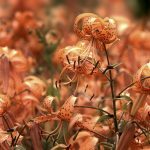 Read more articles about Tiger Flower.